Two genres that have been significant in post-war Hollywood cinema are the conspiracy movie and the disaster film. With the end of World War II in the destruction of Hiroshima and Nagasaki and the nuclear arms race that followed, and the paranoia of the Cold War, it is conspiracy and disaster movies that have voiced America’s deepest fears about its relationship to the rest of the world on the one hand, and the struggle to define what is American and what is un-American at home. From the point of view of someone interested in how cinema deals with these types of questions these genres are interesting because of the way they occur together and interact. Both genres deal with fundamentally the same problem: that our deepest fears may be realised – that the world is coming to an end and that the person we share our life is not who we think they are. Both these genres deal with anxiety, the prolonged, persistent, irrational belief that something (although we may not know what) is going to happen. An intense anxiety about an apparent loss of autonomy or self-control – the conviction that one’s actions are being controlled by someone else, that one has been ‘constructed’ by powerful agents (2001: 62). Agency panic provides a model of conspiracy in American culture based around a notion of diminished human agency in which the individual is subject to a broad array of social controls (the conspiracy). Conspiracy theory, in Melley’s view is a defence of the integrity of the self in the face of anxiety about the nature of individual action. As I have discussed elsewhere, the conspiracy movie is characterised by the emotional response of anxiety. Agency panic from The Hidden Persuaders, to the Unabomber’s manifesto, and to Invasion of the Body Snatchers is such an emotional response. Disaster movies are harder to define as the cause of the disaster may vary considerably, but are characteristic by a certain scale of their events – disasters should be big, especially in Hollywood – or by their magnified impact on a small but largely self-contained social group (i.e. Jurassic Park (1993), Airport ’77 (1977)). Global Pandemics (Panic in the Streets (1950), Outbreak (1997)), geological disaster (Earthquake (1974), Volcano (1997)), or the complete and utter destruction of the Earth (Armageddon (1997)) are all recurrent topics. There is also a sub-genre of films in which mass transit systems are out to get Americans – having watched films such as Airport (1970), Speed (1994), or even Titanic (1997) is it any wonder that investment in US public transport is lacking and that that car is supreme? Like conspiracy films, disaster movies put the viewer in the position of being unable to control a situation: earthquakes, swarms of killer bees, meteors cannot be reasoned with. Something terrible will happen and we will not be able to control it. The potentiality of the disaster is the terrible thing – it is this that produces in the viewer a sense of anxiety. Disaster movies are an essentially earthbound form: they operate, almost by definition, within the realm of the possible. People must believe ‘it’ could – indeed, very well might – happen to them (Roddick 1980: 246). There is an initial loss of agency in the disaster movie leading to panic – but, and this is where the genre diverges from the conspiracy film, that loss of agency can ultimately be recovered. The world may never be the same again but human beings survive. We will be able to land the plane safely, the meteor will be destroyed (at the cost of Bruce Willis), the aliens will be defeated by a computer virus (which in no way plagiarises The War of the Worlds) – there will be a plan and that plan will lead to the continuation of the human race. There are also some films that involve both conspiracies and disasters: Deep Impact (1997), for example, starts off with a journalist trying to uncover what she thinks is a conspiracy but in fact uncovers a disaster (a meteor heading for earth); while in The China Syndrome (1979) California is a risk because of cover-up at a nuclear power plant. To chart the changing impact of the conspiracy film and the disaster movie I have searched books, databases and the internet to find Hollywood’s output since the end of World War II and have come up with two samples on which I am going to base my analysis of anxiety in Hollywood cinema. 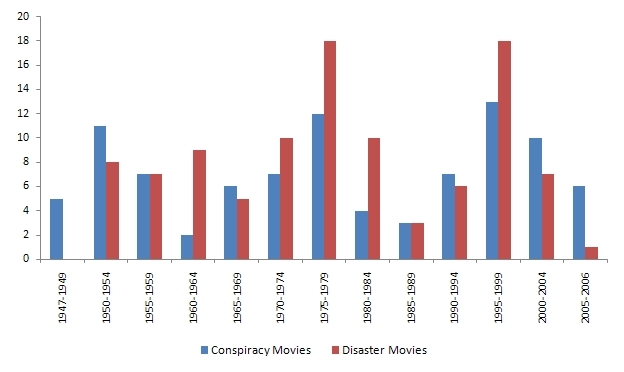 I have identified some 93 conspiracy films and 102 disaster movies produced in Hollywood from 1947 to 2006 inclusive (not including TV movies, straight-to-video), and plotting the number of these types of films released by 5 year periods we can see some clear trends (Figure 1). Obviously, cycles of films do not fit neatly into five year periods, and this data set will continue to grow as I carry on the research but it is a useful guide. There have been three major cycles of conspiracy movies: the ‘red scare movies’ of the early Cold War (1947-1959, 30 films); the New Hollywood films, in which the individual is threatened by state institutions (1965-1979, 25 films); and from 1990 to 2006, which includes the nostalgia/history films of the 1990s (e.g. JFK (1991)), bog-standard conspiracy genre-fare (e.g. Shadow Conspiracy), and new millennium films that deal primarily with the problematic nature of memory (Paycheck (2003)), identity and agency (The Bourne Identity (2002)), and reality (The Matrix trilogy (1999-2003). Although the conspiracy film never disappears, it does drop off markedly in the early 1960s (8 films) and the 1980s (7 films). The disaster movie is more of a constant feature of post-war Hollywood cinema, and does not have such large swings in popularity as the conspiracy film. Nonetheless, there are clusters of disaster movies – in the 1950s and 1960s there are 15 and 14 films, respectively; in the 1970s this increases to 28 films; there are 13 films in the 1980s (almost all of which are released in the first half of the decade); before another increase in the 1990s to 24 films (of which 18 come in the second half of the decade); and 8 in the 2000s, with 7 released from 2000-2004. The peak years for disaster movies are 1979 (7 films) and 1997 (8 films). Of 102 disaster movies, the disasters are: alien invasion (5 films), disease (10 films), man-made disasters (i.e. fire) (5 films), natural disasters (35 films), nuclear disasters (11 films), and disasters involving some form of transport (36 films). Of the 35 natural disaster films 3 involve avalanches, 9 involve some type of fauna (including bees (The Swarm (1978) and dinosaurs (Jurassic Park (1993))), 13 are geological (i.e. volcanoes, earthquakes), 5 involve meteors, and 5 involve some form of extreme weather event from tornadoes to hurricanes to global warming. Of the 36 transport disaster films 2 involve buses, 10 involve boats, and 24 feature aircraft disasters. In summary, the genres of the conspiracy film and the disaster movie a born in the early years of the Cold War and their fortunes broadly coincide as their popularity waxes and wanes – particularly in the 1970s and 1990s. That they should occur together is, I think, due to the shared basis in exploring the our anxiety about the nature of the world and the potential for action in the face of events that exceed our control. Timothy Melley, ‘Agency Panic and the Culture of Conspiracy,’ in Peter Knight (ed.) Conspiracy Nation: The Politics of Paranoia in Post-war America. New York and London: New York University Press, 2001: 57-81. Nick Roddick, ‘Only the Stars Survive: Disaster Movies in the Seventies,’ in D. Brady (ed.) Performance and Politics in Popular Drama: Aspects of Popular Entertainment in Theatre, Film, and television 1800-1976. Cambridge: Cambridge University Press, 1980: 243-269. This piece was originally presented as a paper at the New Nightmares Conference at Manchester Metropolitan University in April 2008. I am currently working on an expanded version which will look more closely at anxiety in The X-Files, while also examining the role of anxiety in some other Hollywood genres. The mental flow model of the viewer’s experience of the cinema proposed by Torben Grodal (1997, 1999, 2004) takes film genres to be forms constructed in order to evoke characteristic emotions that are intimately connected to generic themes and narrative structures. In this model, the horror film evokes the emotion ‘fear,’ producing autonomic responses of crying, shivering, and screaming in the viewer. Paranoia is frequently cited as a recurrent generic theme of the horror film (e.g., Orr 2000, Pratt 2001); and Kim Newman identifies a sub-genre of the ‘paranoid horror’ film in which ‘the Establishment is a monolithic, all-encompassing Evil’ (1988: 79). Grodal (1997: 172-173, 250-252) also links horror and paranoia. In this paper I argue that characteristic emotion of paranoia is not fear but anxiety, and films that evoke this emotional state in the viewer demonstrate numerous differences from the horror genre. These differences are evident in the type of emotional responses experienced by the viewer and the level of their intensity, as well as in the generic themes, and narrative structure of the paranoid film. The purpose of this paper is to distinguish paranoid films from the horror genre in Hollywood cinema, and I utilise the mental flow model in drawing this distinction. Consequently, this paper is at once an implementation of this model and a refinement of it. Cognitive approaches to emotion in the cinema reject romantic and psychoanalytical theories of emotion as irrational negations of reality to assert that cognitions and emotions work together in allowing us to evaluate our environment and as a basis for adaptive behaviours. Emotions are action tendencies that require cognition to recognise the cause of emotions and to evaluate appropriate motor responses. Emotions are structured states that consist of physiological changes, feelings, and thinking; and have a particular object as their focus or target (Plantinga and Smith 1999). For Grodal, the viewer’s experience of a film must be described as a temporal flow that proceeds from perception to (simulated) motor actions and is mediated by innate emotional functions and cognitive schemata. There are three modes of emotional functions: the telic mode consists of voluntary, goal-directed actions and thoughts; the paratelic mode consists of experiences, actions, and thoughts that take place without a specific goal; and the autonomic mode, which consists of non-voluntary emotional responses and is activated when the subject is unable to exert control over his or her situation. The activation of these modes is related to the forward flow of the narrative so that there is ‘a systemic relation between embodied mental processes and configurations activated in a given type of visual fiction and the emotional “tone” and “modal qualities” of the experienced affects, emotions, and feelings in the viewer’ (Grodal 1997: 3). The forward flow of narrative events in the diegetic world of a film guides the viewer through a sequence of emotional reactions, and is structured by canonical narratives that ‘consist of one or several central [characters], a series of emotion-evoking conditions, and a series of actions to alter conditions and to evoke preferred states’ (Grodal 1999: 137). In this model, the main film genres are based on innate features of mind and body, which presuppose specific mental mechanisms as their necessary (but not sufficient) conditions for their existence. Consequently, genres – as prototypical narratives – are constructed in such a way as to evoke a characteristic emotion (see Table 1). An example of the cognitive approach to emotion and genre is the horror film, which may be described as a prototypical narrative in which a character (or characters) is confronted with a hypernatural antagonist producing autonomic responses that are transformed into telic emotional states that are the basis for (simulated) motor actions leading to the destruction of the antagonist. The viewer identifies with a character that is initially marked by an inability to act when confronted with a monstrous threat. This antagonist is hypernatural, deviating from norms of behaviour, the laws of physics, the known facts of history, and is usually supernatural or possesses seemingly superhuman qualities. Faced with such a threat, the character – and by identification, the viewer – experiences a state of paralysis, in which the inability to act triggers responses of shivering, trembling, crying, vaso-motor constrictions, breaking out in goose-pimples, and other autonomic responses (Grodal 1997: 172). This inability to act gives way to a telic mode of experience as the character overcomes the cognitive dissonances created by the antagonist to understand the nature of the threat encountered, devises a pan to eliminate that threat, and successfully executes it. The narrative structure of the horror film guides the viewer through a progression from autonomic to telic modes of experience, from the unwanted emotional state of fear to the preferred emotional state of safety. Dracula (Tod Browning, 1931), for instance, is a prototypical horror narrative, in which the heroes are confronted with an immortal vampire capable of changing his physical form and therefore represents a hypernatural threat, and can only be destroyed once the lore of the vampire has been understood and a plan of action based on symbolic-ritual codes of behaviour is carried out. Anxiety as an emotional state can be distinguished from fear – though it is not always easy to do so (Edelmann 1995). Like fear, anxiety is a state characterised by ‘subjective, consciously perceived feelings of tension and apprehension, and heightened autonomic nervous system activity’ (Spielberger et al. 1970: 3); but where fear is a rational response to a specific and identifiable threat producing intense emergency reactions that recede with the removal of the threat, anxiety is ‘the tense anticipation of a threatening but vague event; a feeling of uneasy suspense … In its purest form anxiety is diffuse, objectless, unpleasant, and persistent. … Anxiety is a state of heightened vigilance rather than an emergency reaction’ (Rachman 1998: 2-3). The differences between fear and anxiety are summarised in Table 2. Paranoia is ‘a mental disorder characterised by the presence of persistent non-bizarre delusions of persecutory, grandiose, or other self-referential content’ (Scheuer 2001: 1134). This content typically takes the form of a perceived ‘loss of autonomy, the conviction that someone’s actions are being controlled by someone else, or that one has been “constructed” by powerful, external agents’ (Melley 2000: vii), and reflects an uncertainty about the causes of individual action in the face of a persistent but vague threat to the self. Consequently, paranoia is characterised by an emotional state of anxiety. The distinction between the emotional states of fear and anxiety makes it possible to nuance the mental flow model, and to make a distinction between the horror genre characterised by fear and the paranoid film characterised by anxiety. The differences between the Hollywood paranoid film and the horror genre are evident in the level of intensity of emotional responses experienced by the viewer, the generic themes of the paranoid film, and the structure of the narrative. In the paranoid film, the unwanted emotional state of anxiety is not dispelled, and, unlike the horror film, autonomic responses do not give way to telic modes of experience. These differences are summarised in Table 3. Examples of these differences can be identified in Enemy of the State (1998) and The X-Files (1998). In Enemy of the State, Robert Clayton Dean (played by Will Smith), a Washington, D.C., attorney finds himself in the midst of a frantic search for a recording of the assassination of a U.S. congressman (Jason Robbards) he is unaware he possesses. The film presents a vision of how anyone – accidently and innocently – can be become the victim of a conspiracy, and in doing so presents the viewer with a diegetic world in which seemingly everyday objects become sources of anxiety. Tracking and bugging devices are planted inside shoes, pagers, pens, etc. Telephones are tapped and private conversations recorded without the knowledge of the participants. The film has numerous action sequences, but derives its emotional impact from the suggestion that this could – indeed, very well might – happen to the viewer. The film is thus characterised by a pervasive sense of unease, producing apprehension, tension, and autonomic responses albeit without the emotional outbursts of crying, shivering, etc. The emotional response of the viewer is then similar to that experienced in watching a horror film, but has a lower level of intensity. This lower level of intensity is, in part, generated by Dean’s lack of awareness of the dangerous circumstances in which he finds himself – repeatedly throughout the film he states that he does not know why he is being pursued. The viewer, however, is aware of the nature of the conspiracy, and tensely anticipates the dangers that will befall Dean. It is this tense anticipation that produces a state of anxiety, and is predicated on the viewer’s identification with Dean as the hero and this excess of narrative knowledge. The viewer is thus placed in a position of hypervigilance. This state of anxiety is not transformed into telic modes of action until the very end of the film, and then only in a limited fashion. With the assistance of an anonymous former conspirator, Brill (Gene Hackman), Dean is able to eliminate the immediate threat posed by his pursuers. However, the central issue of the film is not resolved. The threat of the unregulated and nightmarish applications of surveillance technologies and information gathering systems remains. The narrative thus remains unresolved, and the closing shots of the film echo the opening titles with shots of a satellite orbiting the earth, gathering information, and a montage of surveillance images. The threat posed by the conspirators is only temporary, and is only the visible threat – the unseen surveillance technologies (e.g., satellites, computer tracking systems, directional microphones, etc) remain invisible and remain a threat to society. The need for hypervigilance on the part of the viewer continues, but is rendered problematic by the failure of the film to provide a solution to the regulation of surveillance. The capacity for voluntary modes of behaviour is again transposed to the field of spectacular action – for example, the escape from the research laboratory or Mulder’s rescue of Scully from the alien ship – and not the resolution of the narrative. As in Enemy of the State, the nature of the conspiracy at the heart of the film remains elusive. It is difficult in this film to determine who or what the antagonist is. The aliens are never clearly presented on the screen, and we learn nothing of their nature or their goals – there is no ‘alien lore’ that can form the basis for the heroes’ destruction of the enemy. The conspirators lack personality, and are identified only by vague descriptions (e.g., the cigarette-smoking man, the well-manicured man, etc. ), and the film provides only tantalising glimpses that the conspiracy even exists. The viewer is thus left in a state of confusion with their paranoid suspicions intact, but without the possibility of a resolution. Again, the ending to this film – a hearing to determine the reasons behind the destruction of the office building – mirrors an earlier scene, and explicity rejects the narrative of the Agent’s investigation in the absence of ‘hard evidence.’ The conclusion of the film sees Agents Mulder and Scully reassigned to the X-files in order to investigate inexplicable phenomena, and the reconstitution of the conspiracy at a new location, creating a looped and unending narrative structure that is common to paranoid thrillers (e.g., The Parallax View, 1974). In the early-1970s, Tony Tanner wrote that ‘the possible nightmare of being controlled by unseen agencies and powers is never far away in contemporary American fiction’ (1971: 15, my emphasis). It is certainly the case that paranoia has been a constant element of American popular culture in the post-war era, but while the paranoid scenarios of Enemy of the State and The X-files might be described as nightmarish they should not be seen as a part of the horror genre. Applying the mental flow model to these films, it is possible to identify a genre of the paranoid film in which the characteristic emotion evoked is anxiety, and which shows marked differences from the horror film. Enemy of the State (Touchstone Pictures\Jerry Bruckheimer Films\Scott Free, 1998) prod. Jerry Bruckheimer, dir. Tony Scott, wr. David Marconi, ph. Daniel Mindel, ed. Chris Lebenzon, m. Harry Gregson-Williams, Trevor Rabin. Cast: Will Smith (Robert Clayton Dean), Gene Hackman (Brill), John Voight (Reynolds), Lisa Bonet (Rachael Banks), Regina King (Carla Dean), Loren Dean (Hicks), Barry Pepper (Pratt), Ian Hart (Bingham), Stuart Wilson (Congressman Albert). The X-Files (Twentieth Century-Fox, Ten Thirteen Productions, 1998) prod. Chris Carter, Daniel Sackheim, dir. Rob Bowman, wr. Chris Carter, Frank Spotnitz, ph. Ward Russell, ed. Stephen Mark, m. Mark Snow. Cast: David Duchovny (Special Agent Fox Mulder), Gillian Anderson (Special Agent Dana Scully), John Neville (Well-manicured Man), William B. Davis (Cigarette-smoking Man), Martin Landau (Alvin Kurtzweil, MD), Mitch Pileggi (Assistant Director Walter Skinner). Edelmann, R.J. (1995) Anxiety: Theory, Research, and Intervention in Clinical and Health Psychology. Chichester: John Wiley and Sons. Grodal, T. (1997) Moving Pictures: A New Theory of Film Genres, Feeling, and Cognition. Oxford: Clarendon Press. Grodal, T. (1999) Emotions, cognition, and narrative patterns in film, in C. Plantinga and G.M. Smith (eds.) Passionate Views: Film, Cognition, and Emotion. Baltimore and London: Johns Hopkins University Press: 127-145. Grodal, T. (2004) Frozen flows in von Trier’s oeuvre, in T. Grodal, B. Larsen, and I.T. Laursen (eds.) Visual Authorship: Creativity and Intentionality in Media. Copenhagen: Museum Tusculanum Press\University of Copenhagen: 129-167. Melley, T. (2000) Empire of Conspiracy: The Culture of Post-war paranoia in Post-war America. Ithaca: Cornell University Press. Newman, K. (1988) Nightmare Movies: A Critical History of the Horror Movies. New York: Harmony Books. Orr, J. (2000) The Art and Politics of Film. Edinburgh: Edinburgh University Press. Plantinga, C. and Smith, G.M. (1999) Introduction, in C. Plantinga and G.M. Smith (eds.) Passionate Views: Film, Cognition, and Emotion. Baltimore and London: The Johns Hopkins University Press: 1-17. Pratt, R. (2001) Projecting Paranoia: Conspiratorial Visions in American Film. Lawrence, Kan.: University Press of Kansas. Rachman, S. (1998) Anxiety. Hove: Psychology Press. Scheuer, A.D. (2001) Paranoia, in The Corsini Encyclopedia of Psychology and Behavioural Science – Volume Three, third edition, edited by W.E. Craighead and C.B. Nemeroff. New York: John Wiley & Sons: 1133-1135. Spielberger, C.D., Gorush, R.L., and Lushene, R.E. (1970) Manual for State-Trait Anxiety Inventory. Palo Alto, CA: Consulting Psychology Press. Tanner, T. (1971) City of Words. London: Jonathan Cape.